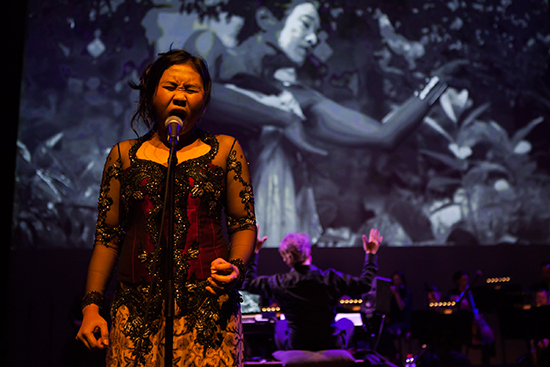 The abundant visual stimulation of a chamber-sized Melbourne Symphony Orchestra concert with projected film and a 20-piece gamelan orchestra incorporated in the mix makes it almost impossible to know where to look. Set to a silent film by leading Indonesian film director Garin Nugroho, Satan Jawa combines Central Javanese gamelan and contemporary Western orchestral instruments in a co-composition by Iain Grandage (Australia) and Rahayu Supanggah (Indonesia). Satan Jawa portrays the ill-fated romance of humble village labourer Setio (Heru Purwanto) and Asih (Asmara Abigail), the daughter of a wealthy family who cruelly reject Setio. In a Faustian turn of events, he makes a pact with the devil to attain the wealth and status that will allow him to win Asih’s hand. 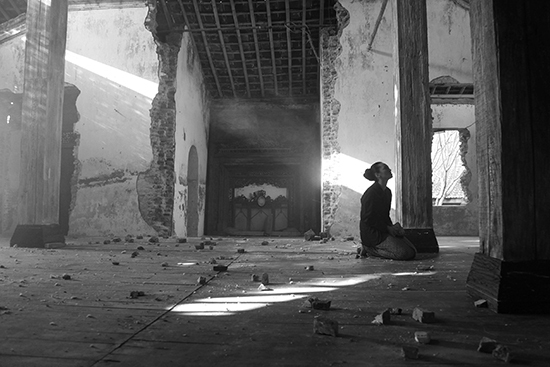 Yet things don’t go as smoothly as hoped, and a joint ensemble led by Iain Grandage takes us through the many dark twists and turns we might expect from a Nosferatu-inspired black and white film. While the amplified string section is at first extremely prominent, an initially tonal soundscape begins to evolve with stunning dovetailing between Western and Indonesian flutes. This fluid dialogue of tonalities peaks later in the film in an hypnotic passage featuring contrabassoon, strings and saron, a type of Indonesian metallophone. The creation of interesting or unusual timbres is one of the most exciting aspects of new music and Grandage and Supanggah certainly excel in this regard. Sitting cross-legged at the front of the stage are three female and two male vocalists, with a third doubling on saron positioned slightly behind. When Setio’s deal with Satan begins to sour, the collective male vocalists deliver a haunting chant accompanied by tremolo strings and solo cor anglais: an exquisite yet ominous combination. In each scene depicting the physical contortion of demonic possession we hear the same chant underscored by instrumental voices such as contrabass clarinet, low brass and low strings. It’s an association that seems basic in theory but the execution is purely chilling. Asih’s journey also allows the female vocalists to take the limelight, particularly during her most emotionally vulnerable scenes. Realising the devil has stolen Setio away, a female singer mirrors the sadness and self-pity to which she temporarily succumbs by incorporating sobbing, shrieking and physical rocking back and forth into her vocal lines. It’s easy to forget we’re supposed to be watching a film when such a heartbreaking performance is taking place live on stage. Another truly unforgettable element of the score comes with the alarming appearance of Satan himself, portrayed on screen by Luluk Ari Prasetyo. Members of the gamelan ensemble trade their mallets, flutes and vocal parts for a variety of drums and other percussive instruments and suddenly we are drowning in rhythmic cacophony. The collaborative force of the MSO plus 20 percussionists might actually have felt threatening if the musicians hadn’t looked like they were having the absolute time of their lives. It’s not quite a happily-ever-after tale but there’s a strangely satisfying conclusion to Satan Jawa I definitely didn’t see coming. Fingers crossed this film with live music returns to screens in the near future; my only dissatisfaction with this action-packed performance was that there was only the one. Watch a brief video about Satan Jawa here.